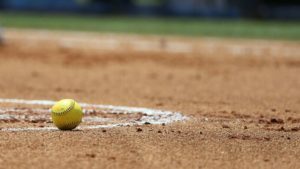 In the opening games of the JV season and the first game ever for Onaga softball, the Rock Creek Mustangs defeated Onaga 3-2 on Monday after taking the lead late in the game. 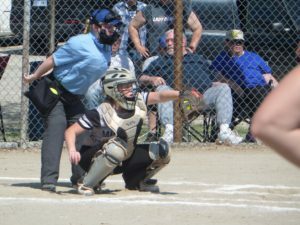 The game was tied at two with Rock Creek batting in the bottom of the fifth when Brooklynn McCormick doubled on the first pitch of the at bat, scoring one run. The pitching was strong on both sides. Sophia Haverkamp struck out 15, while Harley Smith sat down nine. Haverkamp earned the win for Rock Creek, allowing only 1 hit. 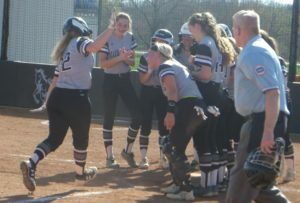 Rock Creek’s Grace Gehl notched her first RBI’s as she drove a home run about 240’ to boost the Mustangs with 2 runs in the 3rd inning of the game. McCormick had 2 hits in the game. In the 2nd game of the doubleheader, Rock Creek’s JV weathered a push by Onaga in the third inning where Rock Creek coughed up four runs, but Rock Creek held on to win 8-6 on Monday. The base paths were crowded in this high-scoring game. Rock Creek collected seven hits and Onaga had nine. The Mustangs pulled away for good with seven runs in the third inning. In the third an error scored two runs for Rock Creek, Molly Sims doubled, scoring one run, Brianna Bradstreet doubled on a 3-2 count, scoring two runs, Emily Ritchey singled, scoring one run, and Haylee Hafenstein drew a walk, scoring one run. Lexi DeWeese doubled in the game, and Shelby Helget notched a hit in the game. Gracie Ward earned the win for Rock Creek, striking out eight. Ward also led the young Mustangs going 2-4 at the plate. Rock Creek nabbed the lead late in the game in a 12-10 victory over St. Marys on Monday. 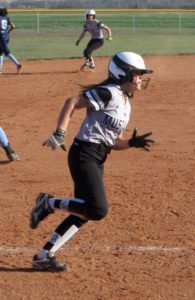 The game was tied at ten with Mustangs batting in the bottom of the sixth when Demi Kunkel singled on the first pitch of the at bat, scoring one run. There was plenty of action on the base paths as both teams collected 17 hits. In the first inning, St. Marys got on the board quickly, scoring 2. The Mustangs answered with two of their own via a leadoff walk to Kunkel followed by Brook Dillon’s single. Dillon stole 3rd and Laney Scott executed a squeeze bunt for a single to score Dillon. In the third inning, senior Haley Petty hit a solo homerun followed by senior Maddi Figge doubling to eventually score by Leighton Herrman laying down a perfect squeeze bunt. Rock Creek trailed the entire game until the bottom of the 6th, when the team would plate 5 runs. The decisive inning included 5 consecutive hits, led by Haley Petty singling, Figge belting out her 2nd double of the game, Tatum Brunkow doubling off the fence, a Leighton Herrman single and a Kunkel single. The Mustang defense held in the top of the 7th to complete the exciting come from behind win. Morgan Searle was the winning pitcher for the Mustangs, striking out four. Megan Prockish, Petty, and Kunkel all had three hits to lead Rock Creek. Game 2 of the twinbill started in the same manner, St. Marys notched 2 runs in the top of the inning – only in this game, the Mustangs answered loudly putting up 9 runs in the home half of the bottom of the first. The team grabbed an early lead on its way to a 13-3 victory over St. Marys on Monday. Rock Creek scored 9 via singles by Sydney Montgomery, Brook Dillon, Demi Kunkel, Tatum Brunkow; doubles by Maddi Figge, Megan Prockish and Laney Scott, and a home run by Demi Kunkel (who went 2-2 in the ½ inning) Rock Creek secured the victory thanks to nine runs in the first inning. Rock Creek committed only 1 defensive error in the game and tallied 14 hits in game 2. (31 hits on the night) Montgomery and Kunkel each collected three hits to lead Mustangs. Morgan Searle got the win for Mustangs. She went five innings, allowing three runs on seven hits and walking zero. 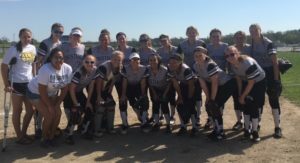 Rock Creek will have a busy week next week when they travel to Riley County on Tuesday, April 24th and then host Clay Center on Friday, April 27th. Rock Creek’s effort to come back from down seven runs in the second inning came up just short, as they fell 12-11 to McLouth on Thursday. The Mustangs managed ten runs in the failed comeback. Rock Creek tallied five runs in the second inning. The offensive onslaught came from a walk by Brook Dillon, a single by Haley Petty, a fielder’s choice by Maddi Figge, and a double by Laney Scott. “We found ourselves in a big hole after the first couple innings down 8-1. We appreciate the fight we showed in competing to make it a game through the 7th, but we really feel this is a game we could have and should have won. Credit McLouth for their aggressive plate mindset. We had two players that had that aggressive mindset in Haley Petty (4-5 with 2 doubles) and Laney Scott with 3 hits, combining for 7 of the 10 Rock Creek hits.” Rock Creek evened things up at ten in the bottom of the fifth inning when Petty doubled on a 1-2 count, scoring one run. Tied 10-10 going into the top of the 7th, McLouth loaded the bases, and was quickly met with an outstanding double play courtesy of centerfielder Maddi Figge who caught the ball and gunned the runner from 3rd out at the plate. The next batter singled for McLouth to score 2 and the Mustangs could not answer in the bottom of the inning. Morgan Searle managed the hill in the loss for the Mustangs, allowing 12 runs over seven innings, striking out seven, walking four. 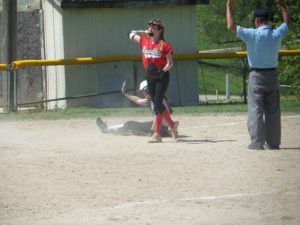 In game two, Rock Creek watched the game slip away early and couldn’t recover in a 6-3 loss to McLouth on Thursday. McLouth chipped away inning by inning, scoring in 4 different innings via 12 hits, while Rock Creek scored 3 runs in the 5th inning. Demi Kunkel got her first homerun of the season with a 2 run homerun that scored Megan Prockish who had already doubled to score Maddi Figge (singled) earlier in the 5th inning. Kunkel went 3-3 in the game. Carmen Mallon took the loss for Mustangs. She completed all seven innings, allowing 12 hits and six runs while striking out five. Rock Creek will face their first MEL opponent – St. Marys on Monday, April 16 at home at 4:00. Rock Creek host games that were slated to be played on Thursday, May 3rd, games got started, but suspended after 1 ½ innings were played because of rain and lots of it. Rock Creek still celebrated their seniors with a meal and an event at the school, but games resumed on Friday, May 4th at 3:00. Rock Creek fell behind early, only 1-0 and then 3-0 through 4 innings, but couldn’t come back in an 11-0 loss to Silver Lake. Rock Creek managed just 4 hits and as many errors in the game. Carmen Mallon took the loss for Mustangs. She surrendered 11 runs on 13 hits over six innings, striking out two. Demi Kunkel went 2-for-2 at the plate to lead Rock Creek’s offense. Sydney Montgomery doubled in the game and Maddi Figge had the other lone hit. In the 2nd game, Rock Creek lost 7-2 loss to Silver Lake. Rock Creek had better offense in game two, but still had 4 errors in the field. Of the 7 hits, Kierra Mosby and Brook Dillon each notched 2, Haley Petty, Laney Scott and Montgomery each found their way on with hits. Morgan Searle took the loss for Mustangs. She surrendered seven runs on ten hits over seven innings, striking out two with no free passes. Between games, the Rock Creek softball family was able to celebrate the contributions of 5 seniors. Brook Dillon, daughter of Todd Dillon and Shaney Kolde, Madison Figge, daughter of Travis & Cherie Figge, Demi Kunkel, daughter of Woody Kunkel and Gena Larson, Carmen Mallon, daughter of George & Cheryl Mallon and Haley Petty, daughter of Duane & Bobbi Petty. Rock Creek will travel to Rossville on Tuesday, May 8 for their final regular season games, prior to hosting regionals on Tuesday, May 15th at Rock Creek. Teams in the regionals are Holton, Jeff West, Hayden and Rock Creek. Those brackets will be available after the 10th. 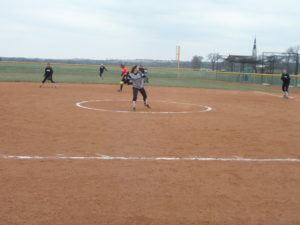 Rock Creek JV watched the game slip away early and couldn’t recover in a 13-3 loss to Riley County on Monday, April 23. The Mustang JV struggled to put runs on the board and had a tough time defensively containing Riley County, giving up 13 runs. Riley County scored seven runs in the third inning. Gracie Ward pitched for the loss in game one, allowing ten hits and 13 runs over five innings, striking out three. Kierra Mosby led Rock Creek with three hits in as many at bats, one being a triple. Alyssa McCormack doubled in the game. Jenna Weers and Josie McFall each notched a single. In game two Rock Creek had a big third inning that propelled them to victory 15-2 over the Falcons of Riley County. Rock Creek scored nine runs in the third inning. The offense in the inning came from singles by Jenna Weers, Kaiton Padget, and Danae Adams, a triple by Alyssa McCormack, a fielder’s choice by Kierra Mosby, and a double by Kara Riffel. Riley had a 1-0 lead in the first two innings, but the big 3rd inning wiped that lead away. Gracie Ward is credited with the victory from the mound. She allowed four hits and two runs over five innings, striking out three. Rock Creek scattered 13 hits in the game. Adams, Alyssa McCormack, Padget, Weers, and Riffel each racked up multiple hits. Adams led Rock Creek with three hits in three at bats. Rock Creek didn’t commit a single error in the field. Rock Creek JV is 6-4 on the season. Mustangs fell behind early and couldn’t come back in a 9-3 loss to Riley County on Tuesday in game two. Rock Creek struggled to contain the offense of Riley County and fell behind early in the 9-3 loss. Rock Creek had 5 hits as a team two each from Dillon and Kunkel and a single from Morgan Searle. The lack of offense paired with a couple defensive errors didn’t bode well for the Mustangs. Searle took the loss from the mound. Defensively, Rock Creek did turn a double play as well as picked off 2 runners from 3rd with throws from senior catcher Demi Kunkel to senior 3rd baseman Haley Petty. Rock Creek is 5-5 on the season with games slated for Friday at home against Clay Center, followed by a makeup game on Monday at home against Abilene. Despite a 10-run deficit in the fourth inning, (down 11-1) Rock Creek almost made a huge comeback and had their chances, eventually falling 14-13 to Clay Center in game one on Friday. The mustangs notched eight runs in the fourth inning. Leighton Herrman, Brook Dillon, Laney Scott, Sydney Montgomery, and Maddi Figge each had RBIs in the frame. Searle took the loss for Mustangs. She went two and two-thirds innings, allowing 11 runs on 11 hits, striking out one and walking one. Carmen Mallon pitched in relief. Rock Creek hit two home runs in the 1st game. Kunkel had a four bagger in the third inning. Montgomery had a long ball in the fourth inning. The team collected 13 hits in the game. Tatum Brunkow, Figge, Kunkel, and Scott all managed multiple hits. Figge and Brunkow each collected three hits. Rock Creek stole eight bases during the game, Prockish led the way with two. Rock Creek has a heavy schedule coming up. Today (Monday vs. Abliene in makeup games), tomorrow on the road to Wabaunsee tomorrow, and then Senior night Thursday at home against Silver Lake. Mustang JV competes in Holton Tournament; goes 1-2 on the day. Rock Creek JV softball traveled to Holton for an 8 team tournament. Rock Creek faced Holton in the opening game, falling behind early and couldn’t come back in a 16-3 loss on Saturday. Rock Creek Mustangs JV struggled to contain the high-powered offense of Holton, giving up 16 runs. Gracie Ward took the loss for Rock Creek. She went four innings, allowing 16 runs on 11 hits and striking out five. Kara Riffel, Kierra Mosby, Danae Adams, and Ward each managed one hit in the contest. In game two of the day, Rock Creek JV defeated Hiawatha in a blowout 14-5; thanks to 10 runs in the 2nd inning by the mustangs. Melanie Holmes, Brianna Bradstered, Adams and Kaiton Padget each added hits and runs in the inning. Mia Leon led the Rock Creek JV to victory on the pitcher’s mound. She allowed six hits and five runs over four innings, striking out six. 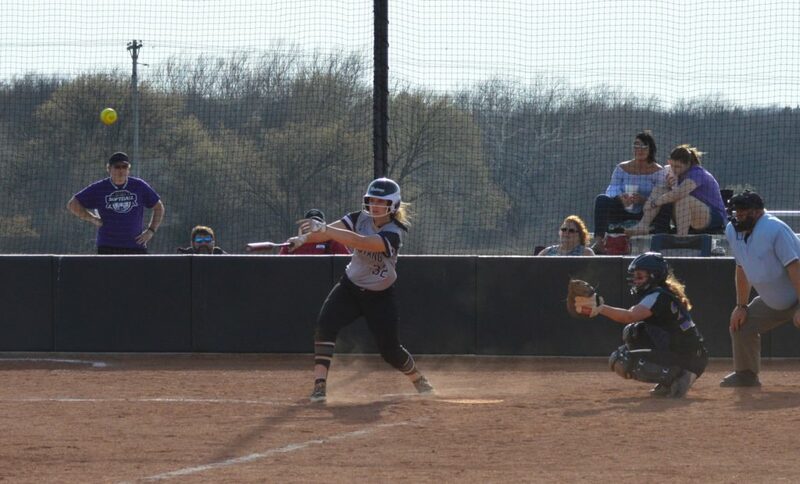 Gracie Ward, Kayla Malbrough, and Kyla McCormack each added hits. Left fielder Alyssa McCormack did a great job catching during the game. In the final game of the tournament and season for the Mustangs’ JV, Rock Creek faced a talented Silver Lake team and fell 17-3. Silver Lake got things moving in the first inning, scoring 7. Rock Creek notched three runs in the second inning. The offense was led by Kyla McCormack and Kierra Mosby, who drove in runs. Gracie Ward pitched for the mustangs while striking out two. Kara Riffel, Danae Adams, Ward, Kyla McCormack, Josie McFall, and Alyssa McCormack (double) each managed hits during the game for the mustangs. Rock Creek JV finishes the season 7-6 with several cancelled games due to weather or opponents not having enough eligible players. Thanks to everyone who supported our JV team throughout the season. Rock Creek traveled to Chapman on Tuesday, April 10. The mustangs won the first game by 11 runs (16-5) and won game two 9-6. Mustangs had all cylinders firing on offense on Tuesday, winning big over Chapman 16-5. Rock Creek opened up scoring in the first inning, when leadoff batter Demi Kunkel tripled and was driven in by Brook Dillon. Chapman answered in the second inning, but the Mustangs pulled away for good with three runs in the third inning. In the third Haley Petty doubled, scoring one run, Morgan Searle singled, scoring one run, and Alexandra Hoelscher’s wild pitch allowed another run to score. Rock Creek scored another four runs in the fifth inning. Dillon and Sydney Montgomery each drove in runs during the inning. Searle led the Mustangs to victory on the pitcher’s mound. She went six innings, allowing five runs on eight hits and striking out five. The Mustangs tallied 13 hits in the game. Laney Scott, Petty, and Searle each managed multiple hits. Scott led with three. Rock Creek stole nine bases during the game as three players stole more than one. Megan Prockish led the way with three. In game two, the base paths were crowded for both offenses in a high-scoring game where Mustangs came out on top against Chapman, 9-6. Again, the mustangs were able to plate runs in the top of the first inning. Kunkel and Dillon singled and eventually scored. Prockish plated a run in the second by reaching on an error, stealing 2 bases and scoring on a wild pitch. Rock Creek scored five more runs in the fifth inning and held on to the lead the entire game, as Chapman continued to threaten with offense. In the 5th Sydney Montgomery, Maddi Figge, and Leighton Herrman, each had RBI hits in the inning. Brook Dillon had 2 hits in the outing. Megan Prockish was wicked on the bases, stealing 5. Morgan Searle pitched Mustangs to victory through 4 innings, allowed three hits and three runs over four innings, striking out three. Carmen Mallon threw three innings to complete the game. Rock Creek will play McLouth at home on Thursday, and then play at home again on Monday, April 16 against St. Marys. In the first game on the twin bill, four runs batted in from Kierra Mosby helped lead Rock Creek JV past Clay Center 16-11 on Monday. Clay Center took a 5-0 lead in to the bottom of the 2nd inning when Rock Creek took the lead 6-5. Jenna Weers knocked 2 doubles in the contest, other multiple hit players were sisters Alyssa McCormack and Kyla McCormack each with a single and double, as well as Mosby with 2 hits. Gracie Ward got the win for the Rock Creek JV. The mustangs had 11 hits in the bout. Rock Creek won game two by run rule 18-6. Clay Center pitching offered up 19 walks that allowed much of the Mustang offense. Danae Adams had a single with 2 RBI’s. Mia Leon earned the victory on the pitcher’s mound for Rock Creek. She went four innings, allowing six runs on three hits and striking out four. The next JV games for Rock Creek will be Tuesday, April 17 at St.Marys, followed by games Thursday at Council Grove, and the JV will host a tournament at Rock Creek on Saturday, April 21.